Nuclear medicine is a specialized area of radiology that uses very small amounts of radioactive materials, or radiopharmaceuticals, to examine organ function and structure. Nuclear medicine imaging is a combination of many different disciplines, including chemistry, physics, mathematics, computer technology and medicine. This branch of radiology is often used to help diagnose and treat abnormalities very early in the progression of a disease. 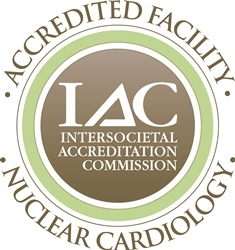 Methodist Hospital Cardiac and Vascular Center Nuclear Medicine is accredited in Nuclear Cardiology by the Intersocietal Accreditation Commission (IAC). Cardiac conditions and chest pain can be diagnosed with nuclear medicine. Accreditation by the IAC means that Methodist Hospital Cardiac and Vascular Center Nuclear Medicine has undergone a thorough review of its operational and technical components by a panel of experts.